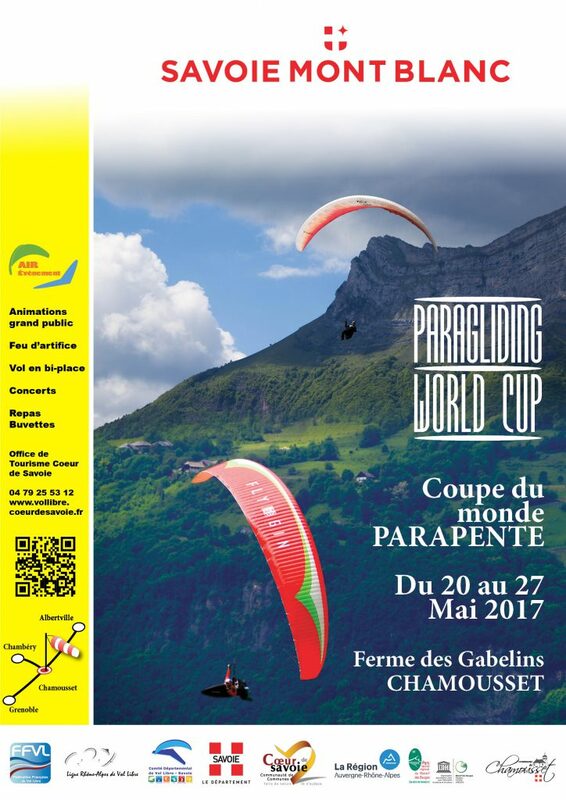 Cœur de Savoie will receive in 2017 a new stage of the Paragliding World CCup 2017 from May 20 to 27. Contact : philippe Roéa :airevenement@gmail.com. To know more about, follow us on Facebook ! Every day around 9:30 am, on the basis of life at the Gabelins farm, welcome and briefing of the pilots for the day, choice of take-off site. Landings of pilots planned 16h on the basis of life. - Welcome of the drivers and opening ceremony. - Festive evening musical entertainment, meals, refreshments, fast food. - In the evening fireworks offered by the commune of Chamousset. - Demonstration of parachuting, at 7:15 pm. - Closing ceremony, trophy presentation. - "Hot air balloon" Bank of Savoy to discover the base of life and to taste the joy of the lightest air. - Mobile climbing wall framed by a State Patent. - Representations of the marionnettic spectacle of the work of d'Antoine de Saint-Exupéry, The Little Prince, The Company of the Tikulent Arts. - Bi-place paragliding from the sites of Montendry or Montlambert. - Demonstrations of : Hang Gliding, Paramotor, Aeromodelling, Skydiving, Kite, Boomerang. - Awareness of the life of raptors with the Regional Natural Park of the Massif des Bauges. - Test and exhibition of Renault by our partner "Renault Albertville". - Snack bar and fast food. - Provisional program, under development.